St. Andrew's is a large parish in the diocese of West Missouri. It offers three Sunday liturgies and draws parishioners from around Kansas City. The church campus is in a neighborhood outside of the city center. The Kansas City metropolitan area, which straddles the border between Kansas and Missouri, has a population of 2.3 million. About 117,000 live within a three-mile radius of St. Andrews. This population is 64% white, 27% African-American, and 5% Latino. The average age is about the same as the average for both Kansas and Missouri, at 38.8. Per capita income is $41,344, well above the national average. Not everyone has shared in that prosperity: median income among African-Americans is significantly below that of whites and Latinos. Educational attainment is significantly higher than the state averages for Kansas and Missouri: many more individuals in the three-mile radius of the parish have earned a bachelor's degree or a graduate/professional degree. The worship bulletins are in a magazine format, 11"x17" folded and stapled, with a profile on the front cover of the parish's outreach ministries that continues after the liturgical information itself. (Some of the music, such as the song of praise, is printed in the back of the bulletin, while other music, such as the sanctus, are printed where they occur in the outline of the liturgy itself.) The visitor accustomed to the typical Episcopal parish bulletin may do a double-take on first encountering this format, but it provides all the necessary liturgical information and communicates important information about stewardship and outreach in an engaging narrative. The bulletin appears to be a "take-home" piece that parishioners will actually take home. The liturgy begins with an organ prelude, followed by the rector welcoming the congregation. The clergy and lay assistants process into the chancel during an opening hymn. The service follows Rite 1. The presider (the associate rector) says the opening acclamation, collect for purity, and summary of the law. The congregation recites, rather than sings, the Kyrie— the texts of the mass that are normally sung, such as the Kyrie, Sanctus, and fraction anthem, are said at this service. The presider says the collect of the day. A layperson reads the Old Testament lesson, and the congregation recites the psalm, after which the deacon reads the gospel. A lay person gives a seven-minute stewardship reflection (it is the season of the annual pledge drive. and this week the reflection and sermon focus on outreach), which is followed by a twelve-minute sermon by the rector. The sermon is grounded in the gospel reading, the story of Zaccheus in Luke 9. The rector deftly connects the story of Zaccheus to outreach and to the congregation's life. The presider leads the congregation in the creed, and the deacon reads the Prayer for the Whole State of Christ's Church and the World. The deacon introduces the confession, the presider absolves the people and reads the "comfortable words," omitting the ones with gender-exclusive language. The presider bids the peace. After a brief exchange of the peace, the rector makes announcements. A soloist sings an offertory anthem ("How beautiful are the feet," from Handel's Messiah) while the deacon sets the table. As the monetary gifts are brought forward, the congregation sings "Praise God from whom all blessings flow" to Old Hundredth. The presider prays Eucharistic Prayer II and leads the people in the Lord's Prayer, after which the people come forward and receive communion at the altar rail. The organist plays soft, instrumental music during the distribution. After the deacon has cleared the table, the presider leads the people in post communion prayer and blesses them. The presbyters and lay assistants depart during the singing of a hymn, while the deacon remains at the front of the church to dismiss the people from the chancel. An organ postlude concludes the service. The liturgy begins with an organ prelude, followed by the rector welcoming the congregation. The organ launches into the opening hymn, and the choir, lay assistants, and clergy process through the nave and into the chancel. The presider (the priest for young adults and families) says the opening acclamation and the collect for purity, after which the congregation sings a song of praise in place of the Gloria ("Here I Am to Worship" by Tim Hughes), with piano accompaniment. The presider prays the collect of the day, and a lay person reads the Old Testament. The congregation sings a sequence hymn, during which a gospel procession forms and moves out. The deacon reads the gospel in the midst of the congregation. A lay person gives a stewardship reflection (it is the season of the annual pledge drive. and this week the reflection and sermon focus on outreach), which is followed by a sermon by the rector. The sermon is grounded in the gospel reading, the story of Zaccheus in Luke 9. The rector deftly connects the story of Zaccheus to outreach and to the congregation's life. The presider leads the congregation in the creed, which is followed by the prayers of the people. The deacon introduces the prayers, which are then led by a lay person, using a form composed by the late Ormonde Plater. The deacon says the concluding collect and then introduces the confession of sin. The presider gives the absolution and bids the Peace. The exchange of the Peace is long and fulsome. The rector makes necessary announcements. The choir sings an anthem by Richard Farrant as the deacon sets the table. As the monetary gifts are brought forward, a "presentation hymn" is sung: "Praise God from whom all blessings flow..." to the tune Lasst uns erfreuen (rather than the over-used Old Hundredth. The presider, joined at the altar by the deacon, rector, and associate rector, chants Eucharistic Prayer A (the eucharistic prayer rotates seasonally). The service music is eclectic: the Schubert Sanctus, paired with a praise song (Dennis Jernigan's "You Are My All in All") as the fraction anthem. The congregation comes forward after the invitation and receives communion along the altar rail. Traditional hymns ("Lord Jesus, think on me..." to Southwell and "The great Creator of the worlds..." to Tallis' Ordinal, both 16th-century tunes) are sung during the distribution. Laypersons in the Order of St. Luke offer prayers for healing by the columbarium. After communion, the presider leads the postcommunion prayer and blesses the people. The deacon remains behind and dismisses the congregation from the chancel, after the other clergy, lay assistants, and choir process out to a hymn. The service ends with an organ postlude. This evening service begins with the church in dim light. Complicating the use of light and dark as a symbol is the start time, a bit more than an hour before sundown (which, on October 30, was 6:19pm), but the church's windows are high and relatively small, so a sense of relative darkness is created. Music stands for a select choir (the Chancel Singers) are arrayed on either side of the altar, forming a semicircle. The congregation sits in the choir stalls of the chancel, and the presider and a vested lay assistant sit in clergy stalls at the far end of the chancel from the altar. An ambo, flanked by two torches, is placed in the center of the chancel, just before the entrance to the altar rail. Along the sides of the nave, in a chapel by the columbarium, prayer stations are set up: one station has a set of votive candles burning next to the Paschal candle; one has an icon and bowl of burning incense on the chapel altar; another has a screen flashing images, on a table with votive candles before the columbarium. The liturgy follows the Order of Worship for Evening. The presider (the rector) says the opening acclamation, and the entire congregation joins in reciting the short lesson of scripture. The presider says the prayer for light, and the lay assistant lights the altar candles and ambo torches while the choir sings a Kyrie. The choir then sings the Phos Hilaron. The presider prays the collect of the day. A lay person reads the Old Testament lesson. The congregation joins in singing the sequence hymn ("Lord Jesus, think on me..." to Southwell). The presider reads the gospel from the ambo, and then preaches on the story of Zaccheus, linking it to the outreach efforts of the congregation. The presider then leads the congregation in the Nicene Creed. The presider rings a bell, and the congregation disperses to the prayer stations. Some light votive candles and kneel in prayer near the Paschal candle; others sit in pews before the chapel altar, contemplating the icon (a copy of Rublev's Trinity); still others sit before the screen. Most parishioners move from station to station, spending several minutes at each one. The organist plays instrumental music through this time, which lasts about seven minutes. The presider leads the confession and gives the absolution. The congregation exchanges the Peace. The choir sings Richard Farrant's "Lord, For Thy Tender Mercy's Sake" as an offertory anthem as the presider sets the table. The presider begins Eucharistic Prayer A, and the choir sings a choral setting of the Sanctus. Sanctus bells are rung at the words of institution. The congregation is invited to use either the traditional or contemporary forms of the Lord's Prayer, and it seems that some use each. The congregation sings "Christ our Passover" as a fraction anthem. The presider says the invitation to communion, and the choir sings an Agnus Dei from the same, early 20th-century mass setting as the Sanctus (George Oldroyd's The Mass of the Quiet Hour) as the people come forward to receive communion. As the distribution continues, the organist plays soft, instrumental music. The presider leads the postcommunion prayer, blesses the people and gives the dismissal, after which the congregation sings a final hymn. The organist plays a postlude as the people depart. 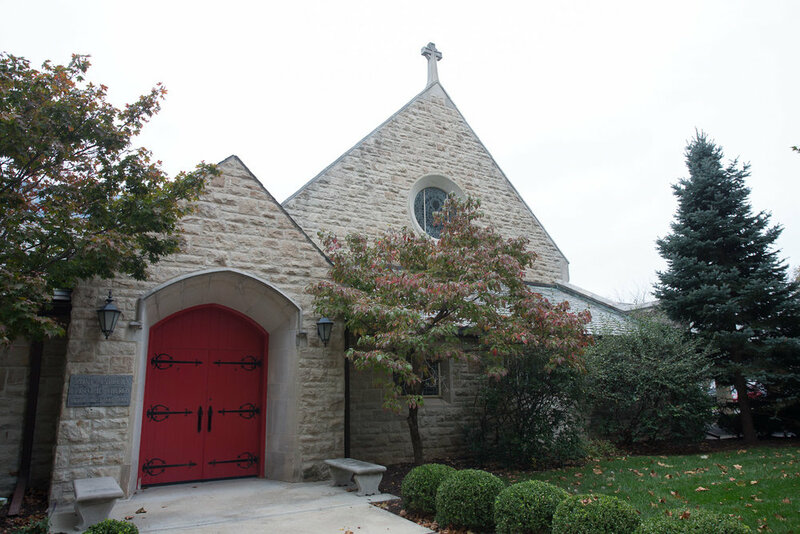 The liturgy at St. Andrew's is planned by the rector, associate rectors, and the music director, with input from the director of children's formation related to children in worship. They work in weekly meetings to prepare liturgies and to review and revise worship bulletins, and to plan for seasonal changes and occasional liturgies. They work hard to offer a variety of liturgical styles: the stability and predictability of the 8:00 Rite 1 service; the more fulsome celebration, blended music, and contemporary language of the 10:15 Rite 2 liturgy; and the meditative feel of the 5:00 "Ascend" service. The clergy have an easygoing rapport with one another, and in the liturgy they each have a warm, natural style that communicates authenticity. The 10:15 liturgy is a great example of a service that manages to combine a diversity of musical styles. On the Sunday of the site visit, the music spanned the 16th to late 20th centuries, involved choral and congregational singing, and did so with remarkable coherence. The use of praise songs in place of the Gloria is a relatively new feature (begun in the last couple of years), and the congregation also uses music from the African-American hymnal, Lift Every Voice and Sing II. Musically, there is something for everyone. St. Andrew's works hard to include young people. A new feature at the 10:15 is the practice of reserving a couple of rows at the front of the church with signs that read, "this row reserved for children and their families and friends." While it will likely take time, the parish is trying to reverse the frequent, Episcopal custom by which parents with small children take seats at the back of the church, which may make it easier to slip out with a fussy child but which means that children cannot see the liturgical action and get bored. Similarly, a note in the bulletin underscores that all baptized people "including children" are encouraged to receive communion, again working to counter longtime Episcopal customs that deferred the communion of children to a later age. 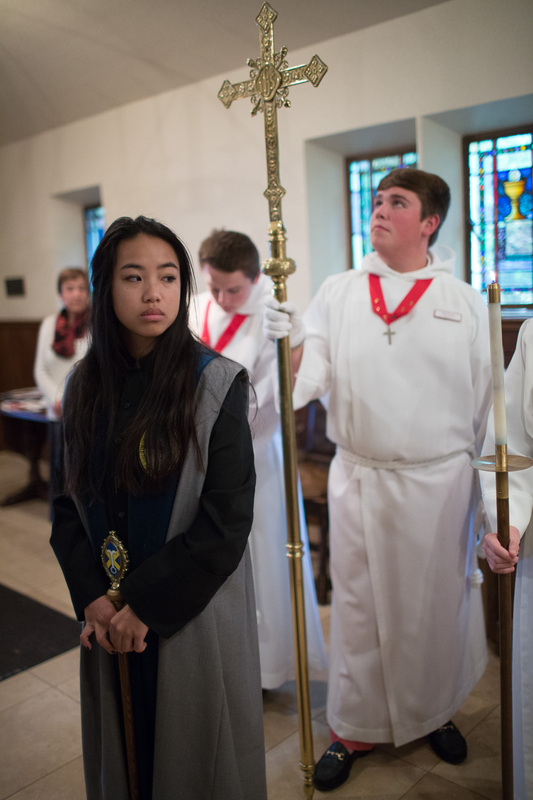 Older children serve as acolytes, and teens serve as vergers, the lay volunteers who coordinate and lead the lay assistants in the liturgy. The 5:00 "Ascend" service was the latest iteration of a weekend evening eucharist. It began as a Sunday evening Taizé-style service with communion, originally with around 40 in attendance, though it dwindled in time to about a dozen. The service was shifted to Saturdays at 5 p.m., on the basis of input from younger families, who believed that this time would work better for families juggling children's schedules, not least Sunday morning sports practices and games. While that service, called "Take 5," started with strong turnout, it dwindled over time, and young families never really embraced it. At the same time, the liturgical style, which relied heavily on contemporary music, did not work as well for those who did attend. The service was rebooted as a Sunday evening, contemplative eucharist. It has continued to evolve: beginning in November 2016, choral evensong replaced the eucharist on one Sunday a month, and as of summer 2017, the contemplative eucharist has been replaced with evensong on the first Sunday of the month and Compline on the third. Scheduling no doubt makes it difficult to attract a large and consistent crowd, when Sunday evening is the last gasp of freedom for busy families before the school- and work-week begins. Apart from scheduling, though, the Sunday evening service has faced other challenges as it has tried to find its niche. The most recent iteration as a contemplative service, may be the best option, meeting a need that is not otherwise met in the Sunday schedule. The service has continued to evolve, moving from a eucharist to a non-eucharistic office (evensong or compline). The staging of the service on the Sunday of the site visit underscored some of the challenges of a "contemplative eucharist": music stands bracketed the altar, creating the visual impression of a performance, which the clergy and lay leadership then had to work hard to overcome (successfully, it should be noted). Choral evensong and sung compline are perhaps the most straightforward liturgies for Anglicans seeking contemplation: the heavy lifting is done by the choir, and the congregation attends to hear the music and readings (joining in only a few spoken parts and perhaps an office hymn, in the case of evensong, and rarely saying anything at sung compline). By contrast, the eucharist of the 1979 prayer book is predicated on the active, meaningful participation of the laity, which entails spoken and sung participation and resists the idea of the liturgy as a "choral performance." Religious contemplation absolutely can happen during choral performances—a "secular" performance of Morten Lauridsen's Lux Aeterna can provoke deeper prayer than many a "participatory" liturgy—but the liturgical idiom of the eucharist is different than that of evensong or compline. It is difficult to mingle the two idioms effectively. Several congregations that do have a long-running contemplative eucharist tend not to use a choir, but to emphasize congregational singing. By contrast, some other congregations with a eucharistic devotion and a contemplative streak tend to offer separate liturgies ministering to each impulse: a eucharist and a separate, contemplative office (whether evensong or compline). The willingness of the leadership to grapple with the challenges and their effort to find the right alchemy (of schedule, style, and form) to make the evening service work will no doubt bear fruit.